Here’s my full RAJAR summary report, originally prepared for RadioWorks as an independent and unbiased analysis of this quarter’s radio listening figures. In a quarter which saw Radio 1 and Nick Grimshaw lose listeners, commercial radio had a great set of results, increasing weekly reach quarter on quarter and year on year. RAJAR, the radio audience survey, shows that over 90% of people in the UK listen to the radio every week. Commercial radio reaches 33.5 million listeners and achieves a listener share of 41.9% versus the BBC’s 55.7%. On a local level, commercial radio completely dominates the BBC, delivering 26.5 million listeners compared to the BBC’s 9.5 million for local and regional services. Digital listening now equates to a 34.3% share of all listening hours. LONDON LISTENING: In the London marketplace the big news is that Capital London has become the largest reaching commercial radio station with 1.95 million weekly listeners. Although they’ve seen a drop in reach to 1.86 million, Magic 105.4 has retained its number one position in terms of share of listening with 5.6% thanks to strong listening hours compared to their London rivals. Heart London has delivered improved reach on last quarter to reach 1.75 million weekly listeners meaning they’re ahead of Kiss 100, who slipped down to fourth position after delivering 1.6 million listeners – almost 200,000 less than the previous quarter. LBC 97.3 saw an increase in their figures to deliver 931,000 weekly listeners and there were also positive results across other London stations including Sunrise Radio, up a massive 53% to reach 348,000, Gold London (363,000) and XFM (574,000). Note: It is possible to measure Classic FM by its London only transmitter, which delivers 1,362,000. LONDON BREAKFAST: The much talked about ‘battle of the breakfast shows’ has again been won by Capital London, with 1,067,000 listeners tuning in to their show from 6-10am. Dave Berry and Lisa Snowdon will no doubt be very happy that they continue as ‘King and Queen’ of the breakfast airwaves, even beating Radio 1’s Nick Grimshaw, whose figures were down considerably. The news that Global Radio will be celebrating most is likely to be the strong performance of Heart London’s breakfast show (6-9am) which saw a jump of 125,000 listeners to 768,000 since Emma Bunton joined Jamie Theakston. Rickie, Melvin & Charlie on Kiss 100 (6-9am) saw their audience significantly drop off this quarter to deliver 651,000, meaning they were beaten into third place by Neil Fox on Magic 105.4 (5-9am) who reaches 765,000 listeners every week. Meanwhile, the multi-Sony Award winning Christian O’Connell has again shown audience growth on his breakfast show across the Absolute Radio Network, and in London, the show delivered a reach of 636,000 listeners. NORTH WEST REGION: In the North West the largest reaching station by far is Smooth Radio, delivering 783,000 listeners. When looking at the reach percentage figures, it is the Isle of Man’s Manx Radio (53%), Carlisle’s C.F.M (37%) and The Bay in Morecombe which all stand out as performing well, whilst the best quarter on quarter improvement in the region is seen at Cheshire’s Silk 106.9, who posted a 16.7% increase to reach 21,000 weekly listeners. NATIONAL STATIONS: Classic FM remains the most-listened-to (single) commercial radio station in the UK. The station has gone above the 5.5 million listener mark for the first time since Q2 2011 and delivers average hours of 7.1, the highest since 2010. Keeping a focus on the national analogue stations: talkSPORT held on to second place, reaching 2.9 million weekly listeners. While Absolute Radio (National + London) delivered 1,687,000. Note: Kiss UK, who broadcast across the UK via online, digital TV, DAB, plus three regional FM licenses, have achieved 4.1 million listeners; Smooth Radio, who also broadcast nationally on DAB and have several regional licences, (with local content in Scotland), have delivered figures of 3.1 million weekly adult listeners. NETWORK STATIONS: The network radio stations, which have become a feature of the UK radio industry over the past couple of years, have again delivered some big numbers this quarter. The largest commercial radio network in the country is Global’s Heart Network, which delivers 7.2 million listeners, closely followed by the Capital Network on 6.9 million listeners. Kiss UK has delivered 4.1 million, Magic UK 3.4 million, Smooth Radio UK 3.1 million, and Real Radio UK 2.1 million. DIGITAL RADIO (including mobile): Digital radio listening has benefited from a 14% year on year increase and now accounts for a 34.3% share of all radio listening, with 49.6% of people listening to digital radio either through DAB, DTV, the internet or ‘other’. The latest RAJAR figures recorded that 23 million adults (44%) claim to live in a household which has a DAB receiver. The number one commercial, digital only radio station in the UK is now Absolute 80s, with almost one million listeners (984,000). Smash Hits have been pushed in to second place with a weekly reach of 942,000, sitting above Bauer’s recent acquisition, Planet Rock, which added listeners to deliver 896,000. Bauer radio has also taken the fourth spot in terms of digital commercial radio as The Hits reached 877,000 listeners. Smooth 70s increased their listening hours this quarter to deliver an average of 7.4 hours per listener, however, their reach figures dropped off to 681,000, whilst Jazz FM maintained their strong figures from last quarter to deliver 604,000 weekly listeners. GROUP PERFORMANCE: The UK’s largest commercial radio group is Global Radio (delivering a total of 19.33 million listeners), thanks in part to the strength of its three core brands: Classic FM, Heart and Capital. Bauer Radio recently added to their Passion Portfolio with the purchase of Planet Rock, which helped them record strong performance figures and as a group (including the Place Portfolio) they recorded a total reach of 13.7 million adults. There appears to be continuing uncertainty at Real and Smooth Ltd. (formerly GMG Radio) since their purchase by Global Radio and that has been reflected in the figures, with the group reach down to 5.57 million from 5.85 million weekly reach; whilst UTV Radio, owners of talkSPORT, reaches 4.2 million listeners. Absolute Radio and its network of decade-based stations have maintained their strong overall figures from last quarter, delivering 3.3 million weekly adult listeners. It is also worth noting that when Global’s acquisition of Real and Smooth Ltd is finalised, the group could be posting figures in the region of 25 million listeners. It’s been another good quarter for digital listening! This quarter saw an increase, with 326 million listening hours, and 46% of the population tuning in to the radio via any digital platform up from 45% last quarter. RAJAR, the radio audience survey, shows that 89% of people in the UK listen to the radio every week. Commercial radio reaches over 33 million listeners and achieves an increased listener share of 43.3% versus the BBC’s 54.3%. On a local level commercial radio completely dominates the BBC, delivering 26.3 million listeners compared to the BBC’s 8.9 million for local and regional services. LONDON LISTENING: In the London marketplace Capital London has held on to the number one spot in terms of reach; despite a drop in listener numbers they still deliver a reach of 2,072,000 adult listeners. However, in terms of listening share it is Heart London which has shown strong quarter on quarter growth to take the top position with 5.3%. Going back to the reach table, Magic 105.4 have maintained their reach from the previous quarter delivering 1,951,000, and Heart London (1,798,000) has held off Kiss 100 (1,740,000) to take third position. A 22.2% quarter on quarter growth to 974,000 from Total Absolute Radio (London) has seen them take fifth position in terms of reach with LBC (809,000) dropping to sixth. Note: It is possible to measure Classic FM by its London only transmitter, which delivers 1,269,000. LONDON BREAKFAST: The much talked about ‘battle of the breakfast shows’ has again been won by Capital Radio London, with 1,156,000 listeners to their show from 6-10am. This is the second set of results for Capital Radio since a change to the line-up saw Dave Berry replace Johnny Vaughan as Lisa Snowdon’s co-host on the breakfast show, and although their reach has dropped slightly, they will no doubt be happy to retain the number one spot. Neil Fox’s Magic Breakfast Show (5-9am) has retained second place with 760,000 listeners, whilst Kiss Breakfast with Rickie, Melvin & Charlie (6-9am) have managed to achieve third position with 735,000 weekly listeners – beating Jamie and Harriet on Heart London (6-9am) who achieved 734,000 listeners. NEW STATIONS: This is the first RAJAR for a number of rebranded stations, with the biggest change being the Orion Media owned, Midlands based, Free Radio stations. Previously reporting as BRMB, Mercia, Wyvern and Beacon, the stations are now part of the Free Radio Network. We often see poor results when stations first rebrand, with listeners getting used to the new name and station and Free Radio has proved no different, dropping from a combined reach of 801,000 to 708,000. Exeter FM also dropped slightly in reach after their rebrand to Radio Exe,but going from 28,000 to 25,000 won’t phase them too much. Eagle Extra, previously County Sound, appears to have bucked the trend, increasing their weekly reach from 6,000 to 13,000. As have Heart Cornwall – previously 105-107 Atlantic FM – who joined the massive Heart Network and increased their weekly reach from 66,000 to 68,000. REGIONAL REVIEW: Briefly looking around the regions; Isle of Wight Radio, recent winner of the Arqiva Station of the Year (for under 300,000 TSA), have posted strong weekly reach figures of 36,000 listeners, 30% of the available population. In Harrogate (North Yorkshire), Stray FM has seen positive quarter on quarter growth, delivering 47,000 listeners (33%) up 3,000 listeners on the previous results. And, if you’re heading down to Weymouth to see the Olympic Sailing, why not tune in to Wessex FM who have posted a weekly reach of 40% (47,000 weekly listeners). NATIONAL STATIONS: Classic FM remains the most listened to (single) commercial radio station in the UK. The station has maintained its reach of 5.4 million adults with listeners tuning in for an average of 6.4 hours. Keeping a focus on the national analogue stations – talkSPORT held on to second place despite not being able to continue their record reach of previous quarters, achieving 2.9 million weekly listeners. While Absolute Radio (National + London) managed improved results, up 9.4% quarter on quarter to 1,763,000. Note: Kiss UK, who broadcast across the UK via online, digital TV and on a number of DAB transmitters plus three regional FM licenses have achieved 4.3 million listeners, while Smooth Radio, who also broadcast nationally on DAB and have several regional licences (with local content in Scotland), has delivered figures of 3.2 million weekly adult listeners. NETWORK STATIONS: The network radio stations which have become a feature of the UK radio industry over the past couple of years have again delivered some big numbers this quarter. The largest commercial radio network in the country is Global’s Heart Network which delivers almost 7.4 million listeners, closely followed by the Capital Network on just under 7 million listeners. Kiss UK has delivered 4.3 million, Magic UK 3.7 million, Smooth Radio UK 3.2 million, and Real Radio UK 2.4 million. 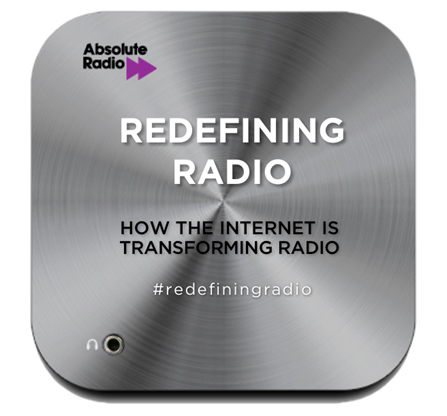 DIGITAL RADIO: Digital listening has grown to account for a 31.5% share of all radio listening, with 46% of people now listening to digital radio, either through DAB, DTV, the internet or ‘other’. The latest RAJAR figures recorded that 21.8 million adults (41.7%) claim to live in a household which has a DAB receiver. The number one commercial, digital only radio station in the UK is now Smash Hits Radio, with over one million listeners (1,011,000). Also owned by Bauer, The Hits has dropped to second place with 973,000. Planet Rock increased their reach again by 10.1% quarter on quarter to take third position with a reach figure of 948,000. Absolute Radio 80s delivered 864,000 listeners to achieve fourth place with Heat Radio delivering 713,000. GROUP PERFORMANCE: The UK’s largest commercial radio group is Global Radio (delivering a total of 19.3 million listeners), thanks in part to the strength of its three core brands Classic FM, Heart and Capital. Bauer Radio with their Place and Passion Portfolios is the second largest commercial group, with a total reach of 13.3 million adults. GMG Radio, who are now a part of Global Radio (subject to confirmation from the competitions commission)has delivered a 5.5 million weekly reach, whilst UTV Radio, owners of talkSPORT, reaches 4.3 million listeners. TARGETED STATIONS: Premier Christian Radio, broadcasting in London on analogue and across the UK via digital (online and DAB) have improved their quarter on quarter reach and now deliver 172,000 listeners every week. There has also been quarter on quarter increases for Sunrise Radio (London) who reach 286,000 weekly listeners. MOBILE LISTENING: RAJAR shows that 18% of adults and 35% of 15-24’s now claim to listen to radio on their mobile phone. Nearly all the UK’s radio stations are providing smartphone apps to enhance the mobile listening experience, and providing advertisers with an additional point of contact. A recent RAB / Other Lines Of Enquiries study into mobile radio listening showed 32% of 16-34 year olds have listened to radio via mobile (at some stage), and 20% listen at least once a week. At a time when iPods, iPhones, and iPads seem to be taking over the world this quarter’s RAJAR results have been great for Radio as almost 91% of the entire population are tuning in every week! And this growth has mainly been boosted by the Commercial Radio sector as stations grow their audience. talkSPORT have helped to drive this growth with an outstanding performance during quarter three. Their highest ever set of figures of almost 3 million weekly listeners were no doubt boosted by the World Cup finals but it would be great to see the station sustain the figures into the next quarter. Absolute Radio have also delivered their best set of figures since the re-brand from Virgin, aided by Absolute 80s bringing in over half a million listeners. And here’s a thought for you…. today it was announced that ITV’s Daybreak show achieved 530,000 viewers. Did you know that there are six stations in London alone whose breakfast shows have more listeners than that!